Vying for the title of “World’s Greatest Villain”, Gru plots to pull off the craziest crime of the century: steal the moon! 2010’s Despicable Me asks us to root for the bad guy. The computer-animated flick introduces us to Gru (voiced by Steve Carell), a nefarious genius who wants to claim the title of “World’s Greatest Villain”. Along with his horde of Minions, he comes up with a variety of plots to achieve this goal. Gru’s big plan: steal the Moon! But he runs into challenges, most of which stem from a new rival: nerdy but heavily-funded Vector (Jason Segel). Gru finds himself constantly lagging behind his new foe’s achievements. 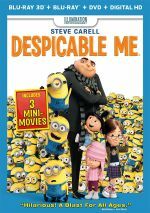 Another unexpected complication occurs when Gru meets three orphan girls named Margo (Miranda Cosgrove), Edith (Dana Gaier) and Agnes (Elsie Fisher). He first encounters them when they attempt to sell him some products to satisfy Miss Hattie (Kristen Wiig), their demanding guardian. Gru initially rebuffs the girls, but he takes them in when he realizes they could help him defeat Vector. Along the way, Gru finds himself increasingly attached to the kids. Despicable Me falls into the latter category, unfortunately. When I saw the flick theatrically, I looked forward to it. 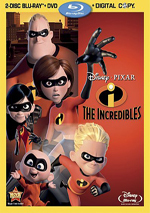 I love animation, and the movie’s trailers promised a glib, clever skewering of the usual comedic action-adventure. Basically, it seemed like it could be a comedic Bond picture that focused on Blofeld. While the flick does occasionally deliver laughs, an awful lot of it falls flat and little about it truly engages. Much of the material strikes me as though it should be funny, but something’s missing. Though the results kept me reasonably entertained, I usually found myself just a wee bit on the bored side. Like the rest of the movie. I can’t fault the actors, as they do their best, but they also don’t manage to present any genuinely memorable bits. In addition to the performers I listed, we get Julie Andrews, Russell Brand, Will Arnett and a few other notables. They should deliver fun turns, so why do I feel so vaguely disenchanted? I certainly like the film’s premise, and we’ve seen proof that the “root for the bad guy” idea works: fall 2010’s provides a much more successful exploration of that theme. Despicable Me lacks the same cleverness and zing. It never becomes a bad movie, but it feels like a disappointing mediocrity. Only a wee smidgen of softness occurred, so a few wide shots were a tad iffy, but those were minor complaints. The vast majority of the flick seemed tight and well-defined. No issues with jaggies or shimmering occurred, and I saw no signs of edge haloes. Source flaws remained totally absent as well. Quite a few extras accompany the film, and we open with an audio commentary from directors Chris Renaud and Pierre Coffin, though the Minions also occasionally show up to interrupt. The commentary covers cast and performances, animation and effects topics, character, prop and set design, audio and music, and story areas. Many commentaries for animated films can veer toward dry technical material, but this one’s much peppier than that. Renaud dominates and gives the piece a good energy level. We also learn a ton about story/character topics, which means we hear of changes made and alternate ideas. We still get good animation details as well, and the addition of the Minions adds a bit of comedy; they show up enough to amuse but not to annoy. This turns into a consistently strong commentary. 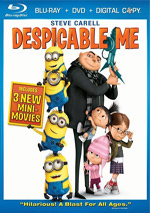 This package includes both 2D and 3D versions of Despicable Me. The comments above relate to the 2D disc – how did the 3D edition compare? Picture quality matched up well with the 2D image. The 3D presentation continued to offer strong delineation and color reproduction, and even the usual hit to brightness seemed insignificant. I thought the 3D image looked very good. Even better, the dimensional effects added a lot of pep and pizzazz to the package. Basic depth always seemed terrific, as even minor components like Gru’s pointy nose used the sense of space well. Despicable Me packed in plenty of more exciting moments, though, and those made the 3D presentation a ton of fun. Gru in outer space was a blast, and various flying/floating components turned into lively aspects of the image. As mentioned in the body of the review, the end credit sequence offered a bonanza for 3D “pop-out” effects, all of which were utterly pointless but still delightful. I loved this 3D presentation and thought it made the movie more enjoyable. Many Universal Blu-rays offer picture-in-picture bonuses called “U-Control”, and here they retitle it as Gru-Control. While the “U-Control” options usually present interviews and other filmmaking bits, “Gru-Control” focuses on comedy. Sure, we get a few comments from producer Chris Meledandri and actors Steve Carell and Russell Brand, but those are rare. Three Mini-Movies appear. These include “Home Makeover” (4:22), “Orientation Day” (4:00) and “Banana” (3:45), each of which focus on the adventures of the Minions. The orphan girls pop up for “Makeover” but otherwise it’s all Minions. The shorts are cute and reasonably amusing. Two featurettes follow. The Voices of Despicable Me goes for 16 minutes, 34 seconds and offers info from Coffin, Renaud, producers Janet Healy, Chris Meledandri and John Cohen, screenwriter Ken Daurio and Cinco Paul, and actors Steve Carell, Jason Segel, Miranda Cosgrove, Dana Gaier, Elsie Fisher, Julie Andrews, Will Arnett, Kristen Wiig, Jack McBrayer, and Russell Brand. “Voices” looks at cast, characters and performances. A lot of this involves gushing praise for the actors, but it’s fun to see them work, and some decent notes emerge along the way. During The World of Despicable Me, we get a 15-minute, 16-second show. It features Carell, Cosgrove, Coffin, Renaud, Daurio, Paul, Meledandri, Segel, Healy, Brand, Andrews, and production designer Yarrow Cheney. “World” examines characters and story elements, set and gadget design, and other movie thoughts. While not unenjoyable, “World” exists as a general promotional featurette. This means it lacks much depth, so although it’s peppy and moderately engaging, it doesn’t tell us much. For a look at the music, we head to the two-minute, 48-second Despicable Beats, which offers remarks from Meledandri, Renaud, and composers Pharrell Williams and Heitor Pereira. It throws out quick thoughts about the score and songs, but it’s way too short to deliver much. The package also includes a DVD copy. It features some but not all of the Blu-ray’s extras. While I don’t view Despicable Me as a bad film, it definitely represents a disappointment. On the surface, the movie seems like it should be a witty adventure, but instead, it ends up as a vaguely dull effort with only occasional laughs. The Blu-ray offers very good picture and audio along with an inconsistent but often interesting collection of supplements. Despicable Me will never be a favorite of mine, but this 3D presentation makes it a lot more fun than in its less interesting 2D version.